rec. live, Hong Kong Cultural Centre Concert Hall, 21 & 23 January 2016. Booklet with synopsis included. German libretto available at the Naxos website. From the very opening moments, it is clear that this is going to be a particularly fine Walküre. 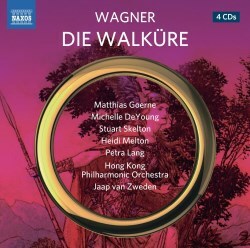 The Hong Kong Philharmonic may have had a chequered past on disc (as well as in the flesh, it has to be said) but they have landed firmly on their feet with their current Wagner project. Under their musical director, Jaap van Zweden, they easily pass muster as one of the more instinctive Wagner orchestras of our time. This is not just very good playing: it is outstanding. It has a wonderful breadth of sound—superbly recorded in these live sessions taken from concert performances in the somewhat difficult acoustic environment of Hong Kong’s iconic wedge-shaped Cultural Centre—and Zweden masterfully manipulates the balance, so that we have a gloriously rich and robust sound across the entire orchestral spectrum. Brass is smooth and polished, never uncomfortably dominant, strings have a tremendously incisive cutting edge, especially in their lower registers, while the woodwind and percussion give it all a sense of great richness. Jaap van Zweden’s decision to perform Wagner’s complete Ring cycle in Hong Kong—the first time it has ever been done there and the first time ever by a Chinese orchestra—left many marvelling at his faith in an orchestra not in any way versed in the intricacies of such music, let alone in involving themselves in serious opera. The four parts are being presented in instalments over a four-year period as concert performances. Das Rheingold opened the proceedings in 2015, with Siegfried being done there this month and Götterdämmerung early in 2018. Each of the four parts of the cycle is being recorded by Naxos which, let us not forget, is also based in Hong Kong. If Das Rheingold was good, Die Walküre is exceptional. Much of that is down to the orchestral playing, which never flags for a moment and produces a truly spectacular conclusion to Act 1 and a wonderfully exhilarating “Ride of the Valkyries” in Act 3. Zweden’s sense of dramatic timing and overall pacing drives it all along with a growing feeling of inevitability. His climaxes are reserved but skilfully managed, and the moments of real musical drama (as with Wotan’s rage as he pursues the errant Brünnhilde in Act 3) are vividly conveyed. As for the cast, Zweden has collected a particularly good team around him. They may not all be at the very top of their game, but none of them could be identified as a weak spot. No reservations about Stuart Skelton as a gloriously robust, virile and assertive Siegmund, nor Heidi Melton’s delicious Sieglinde. Matthias Goerne’s Wotan is uneven, often richly expressive and suitably commanding, especially in his Act 2 command to Brünnhilde to ensure Siegmund’s victory over Hunding. Occasionally he lacks the authority to be convincing, notably in his confrontation with Fricka, who, imperiously sung by Michelle DeYoung, is very much in vocal command here. I am uncomfortable with Petra Lang’s almost screeching swoops as she sets out to do Wotan’s bidding in Act 2. It sometimes seem that her recent switch from mezzo to soprano has left some of the control wanting as she moves from one part of the voice to another. However, as with Falk Struckmann’s Hunding, the characters are vividly portrayed even if the voices have inconsistencies. Particular praise must go to the group of Valkyries who sing with a remarkable sense of unity and vocal balance. Between them they produce some of the most enchanting singing on the discs. Any Wagner production is the result of a successful bringing together of many diverse strands, not all of which may, in isolation, withstand the closest scrutiny. By extremely good fortune, what we have here is a Wagner production which has brought together some very impressive performers and created a singularly outstanding whole. This Hong Kong production is turning out to be a Ring of exceptional quality.